The Crusader cheer program promotes school spirit in support of the University's athletic teams, student body, faculty, staff, and alumni. 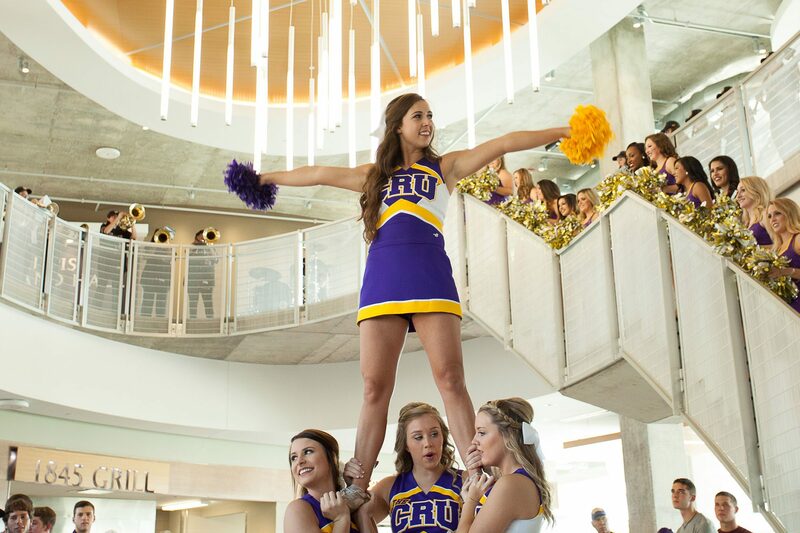 CRU Cheer strives to serve as elite representatives of the UMHB student body as well as ambassadors of the University throughout the community. The cheer program combines two separate elements into it's spirit squads. One team consists of athletes who can be seen on the sidelines of CRU football and basketball games as well as several events throughout the community. The other represents the University at the competitive level competing at Collegiate cheerleading events throughout the year. The CRU Cheerleading Program will host tryouts 2019-20 tryout session April 26-27, 2019, to assess the abilities, leadership skills, and potential of interested and qualified candidates. Tryouts are intended to be a low-stress event. For that reason, they are conducted in a practice-like environment. Candidate’s skills, talents, and their ability to work with current and prospective team members will be evaluated. A short interview with the candidate may be conducted at any time during the sessions. Actual attendance by candidates at the tryout session is highly recommended; however, any individual who cannot attend the tryout session may submit a videotape for consideration. All videos must be included in the tryout packet. Please contact Coach directly for video requirements. Incoming freshmen and transfer students must have completed the regular admissions application process and be accepted to the University prior to tryouts. Candidates must be in good academic and disciplinary standing with the university. Candidates must possess sufficient physical fitness and proper training to execute all required skills during the selection process. Candidates must be covered by health insurance for tryouts and/or sign a participation waiver. Prospective candidates should be involved in high school or competitive cheerleading/gymnastics in some fashion. Each candidates’ individual experiences will be taken into consideration. The tryout packet must be completed in its entirety and submitted by the stated due date prior to tryouts. U- an Understanding that God is leading you on this journey. Prior to tryouts, send in at least 2 letters of recommendation. Email Letters to awinkler@umhb.edu with Candidate Name in the subject line. These letters should come directly from the reference. For questions regarding tryouts, email head coach at awinkler@umhb.edu. Notification of Selection: The new squad will be announced on the CRU Cheerleading Website (this page). Candidates will receive more information regarding the posting at tryouts. All members of the squad will be required to attend UCA Summer Camp and attend work week during summer 2019. All current members of the squad must tryout each year. Coaching staff reserves the right to conduct “walk on” tryouts at any point in time. Two Tryout Clinics will be held before Tryouts. The clinics will be an open practice format to give you an opportunity to show skills and to work with our current team. Please note that the clinic on February 23 has been moved to February 16. The clinics will be held at the Mayborn Campus Center Rec Gym. To reserve a spot at one of the clinics, send Coach Winkler an email.